Every once in a while, a curious email floating through cyberspace will land unexpectedly in your inbox, like a message in a bottle. Such an email arrived this week. This one actually contained a message in a bottle—one that had floated through the Atlantic and back in time to the year before I was born. Joyce sent photos of the bottle (1), the note inside (2) and the postcard (3). His quick Internet detective work was spot-on: The bottle could indeed be traced back to Dean Bumpus (right), one of the first year-round employees of Woods Hole Oceanographic Institution. 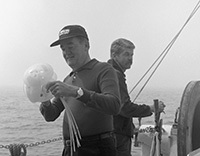 Affectionately known as Bump, his 40-year career at WHOI began in 1937. From 1939 to 1941, aboard the WHOI research vessel Atlantis, Bump helped conduct what many consider the first comprehensive surveys of the marine life of Georges Bank; biologists still find them valuable today. 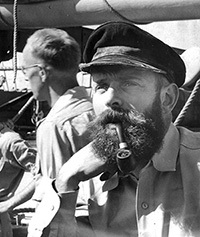 During World War II Bump, Allyn Vine (after whom the submersible Alvin is named), and other WHOI scientists worked closely with the U.S. submarine fleet to instruct submariners on how to use the bathythermograph, an instrument designed by WHOI researchers that measured temperature and density gradients in the ocean. Using bathythermographs, submariners could avoid acoustic detection by enemy surface vessels. 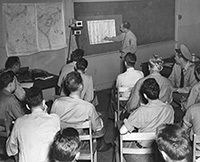 That’s Bump, below right, leading a class to train Navy submariners. The WHOI group was commended by the U.S. Navy for the many lives it helped to save. But Bump is perhaps best known for orchestrating a program from 1956 to 1972 to track surface and bottom currents in the western North Atlantic. Back then, not much was known about the ocean’s currents, and research methods to learn more about them hadn’t advanced much since the 19th century. It wasn’t until the 1970s that sophisticated current meters, subsurface moorings, acoustic listening systems, surface drifters tracked via radio signals and satellites, and other technology began to come online to help reveal the hidden fluid dynamics within the vast ocean. Bump used information from surface drift bottles and yellow seabed drifters shaped like mushrooms (above). 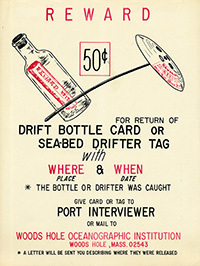 More than 300,000 drift bottles with return-to-sender notes (right) were released by ships and planes along the U.S. East Coast at various “Point A’s.” About 10 percent were returned, providing Point B’s. Bump also deployed more than 75,000 seabed drifters, with a 19 percent return rate. 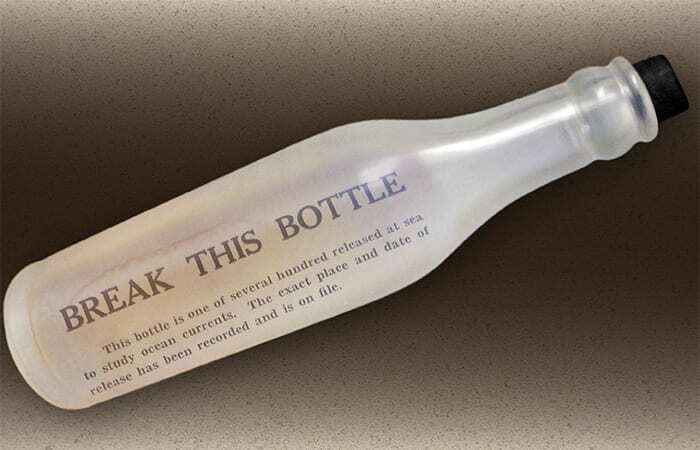 WHOI archivist Dave Sherman tracked down the bottle that Joyce found on Sable Island: No. 21588. It was one of 12 released from the research vessel Albatross III on April 26, 1956, at 8:30 p.m. at 42°18’6″N, 65°30’6″W, not far off Nova Scotia. Three bottles from this batch were recovered later the same year—two in Nova Scotia and one in Eastham on Cape Cod. Given its sandblasted appearance, perhaps No. 21588 came ashore on Sable Island also in 1956, some 300 miles away from its release point, and remained buried and buffeted by dunes until now. Sable Island is a crescent-shaped sandbar about 25 miles long and less than a mile wide about 185 miles southeast of Halifax, Nova Scotia, Joyce wrote in a subsequent email. Besides bottles, the island also seems to catch bigger things, such as ships. Sable Island also makes an ideal hangout for grey seals. Almost every year since 2005, Joyce has assisted on a research project on their population dynamics, going to the island for a month in January when the seals mate and give birth. “We had been conducting a census of tagged seals on the island and while looking for marked animals, I stopped in a little sand gully by a small pond just in from the beach,” Joyce wrote. “I looked down at some garbage that had collected in this little gully and there were about 4-5 bottles sitting there.” The still-plugged one with the note saying “BREAK THIS BOTTLE” caught his eye and launched the search that led to Bumpus. Meanwhile, I did some Internet detective work of my own to find Joyce’s address. 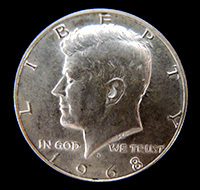 I just sent him this JFK half-dollar (even if postage costs to Canada now exceed that!). WHOI must keep its word, and that’s a bargain price for a good story. Besides, what goes around should come around.